Opera på Skäret are celebrating their 15th Anniversary and to mark this they present two productions. On the small stage, a venue seating an audience of 330, they are mounting the immortal melodramma giocoso L’elisir d’amore by Donizetti. The stage is small, the pit is smaller and consequently this lovable comedy is performed as a chamber opera. 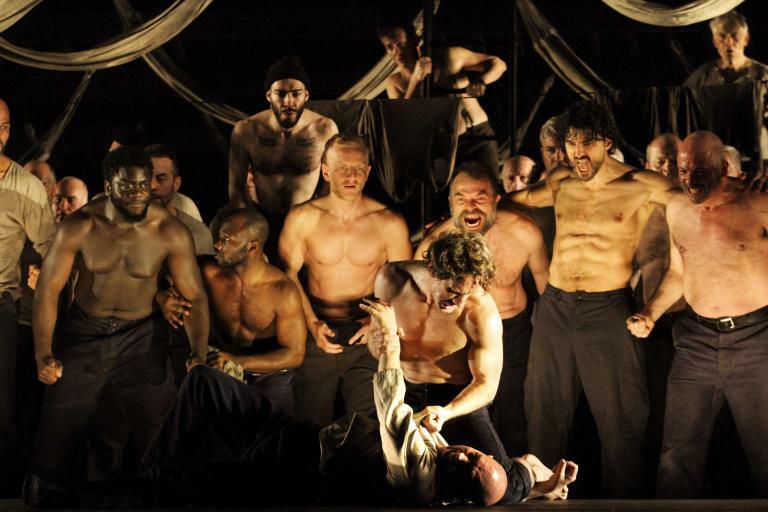 In the pit are seven musicians – sharing an extremely small space – the score is somewhat trimmed and adapted to their forces and there is no chorus. No problem, however. Instead Giannetta deputizes, occasionally together with the other soloists, which is a brilliant idea. Giannetta is a comprimario role and with as charismatic a singer as Rebecca Fjällsby at hand one doesn’t miss the chorus for a second. The stage is empty, apart from a bookcase, where Adina finds a volume of Tristan und Isolde, from which she sings her first aria about the love potion. But remember, this is the medieval story – Wagner’s opera had not even been contemplated when Donizetti composed his opera in 1832. Bengt-Åke Lundin adopts brisk and spirited tempos – but not overly brisk – and the melodramma unfolds elegantly and charmingly. The setting is rural but the execution is urban – an excellent combination. The closeness between stage and auditorium also contributes to a sense of being involved in the action – at least for those in the front rows. To further underline this closeness, Dulcamara makes his first entrance through the aisle. This closeness also means that every gesture, every facial expression becomes so telling, and the demands for the singers’ acting abilities become extra high. Opera på Skäret are fortunate in having a quintet of singing-actors who fulfil those requirements to the full. Rarely have I experienced so much visual contact between the stage and the audience. Both Rebecca Fjällsby and Susanna Andersson are masterly in that respect, and the entire quintet are harmonious in their approach. One feels that these are not five individuals playing five roles but rather an integrated ensemble. Vocally the level is also very high. Adina, Susanna Andersson, Swedish by birth but mainly trained at the Guildhall School of Music and Drama in London, she is pursuing an international career which rarely takes her to her native country. She has few peers and probably no superiors in the lyric soprano stakes. Rarely does one hear such beauty of tone and glittering height: she is a winner in every respect. I am also very happy that Rebecca Fjällsby is promoted from the important but rather peripheral role of Giannetta to a kind of factotum, omnipresent and busy. She will certainly be heard in central roles in the future. Johan Wållberg’s smug Belcore is also a treat and he sings his entrance aria with just the right swagger. He is no newcomer to Opera på Skäret and I hope to see and hear him in future productions. South Korean bass Il Hong has for the last decade been engaged in Vienna and Munich in roles such as Don Magnifico in La Cenerentola and the title role in Don Pasquale. Dulcamara is a role of the same calibre, requiring a grand and flexible bass voice and an expressive body language. Seeing and hearing him makes me think of the legendary Swiss bass Fernando Corena, who was a great name in the 1950s and -60s. His recording of Dulcamara has long been my benchmark interpretation and Il Hong comes very close. (There could be no higher praise!) It is also a treat to have an Italian as Nemorino. Riccardo Gatto is an expressive actor with a bright voice, but he also has the ability to soften his tone and he sings his ‘hit’, the aria ‘Una furtive lagrima’, with brilliance as well as a lovely pianissimo conclusion. All in all this is a production that suits both the tropical summer invading Sweden this year and the unexpected shower at the premiere. Congratulations to all involved!